Most historical visual sources contain at least one or two symbols. A symbol is a way of representing an entity or idea in simple visual form. Every society develops and uses its own set of visual symbols. In the modern world symbols are most readily found in trademarks – like the McDonald’s ‘M’ or the Nike ‘Swoosh’. Other common symbols include religious motifs, logos, icons and traffic signs. In historical sources, visual symbols are generally used to represent a particular person, group, idea or quality. Building an understanding of a visual source requires you to identify and interpret any symbols it contains. Sometimes the meaning of these symbols is obvious. Other historical symbols are subtle or obscure – or their meaning has changed or been forgotten over time. Like other important skills in history, understanding and interpreting symbols takes time and practice. Let’s take a look at some examples of how symbols contribute meaning to historical images. This picture (right) is called The Apotheosis of George Washington. It is a colourised version of an 1802 engraving by John James Barralet. 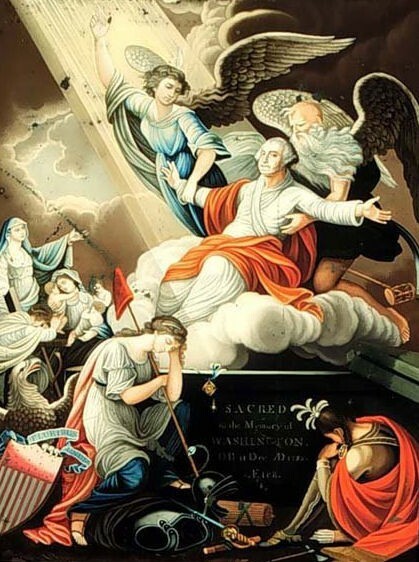 This image mourns Washington’s passing (he died in December 1799) and celebrates his life, leadership and achievements through the use of many symbols. In the centre of the image, Washington is being elevated to heaven by two angels, one of whom is either Saint Peter or Father Time. Washington’s Christ-like gesture suggests that he is willing to go, that he considers his life on earth to be complete. In the lower half of the source, several figures mourn the dead president. The three female figures (far left) are probably the Christian virtues of Faith, Hope and Charity. Lady Liberty, a symbol of America bearing two more symbols (a Liberty Cap atop a Liberty Pole), grieves near his tomb. A Native American, another symbol of America, also mourns at bottom right. Other symbols are scattered below: an eagle (representing strength and leadership); a shield sporting the national motto E Pluribus Unum (‘From many, one’); a sword, helmet and armour (symbols of Washington’s military command); a medal dangling from his grave (probably a symbol of Washington’s involvement in Freemasonry); and a fasces (representing unity, power and authority). Barralet loaded the source with these symbols as a way of representing Washington’s personal qualities, his military and political achievements and the legacy he left for the newly formed United States. Barralet’s piece is unusual because it contains a great number of symbols. Most historical sources use more subtle symbolism. This image, titled Proletarians of all countries unite, was created by Soviet artist Dmitry Moor in 1919. Like most Soviet propaganda its style is more straightforward and minimalist than earlier pieces like that of Barralet. 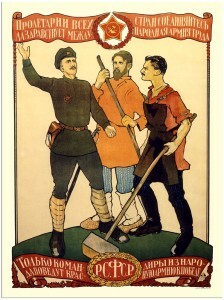 Here Moor depicts unity between three groups: Soviet communists (left), peasants (centre) and industrial workers (right). These groups can be identified by their dress and the items they wear or carry. The Soviet figure wears a military uniform, sports a red star and badge (symbols of communism) and carries a sword and pistol (symbols of armed revolution). The peasant wears simple dress and is carrying a scythe or sickle, while the industrial worker is wearing a leather apron and holding a hammer. The ornate scrolling around the image shows a red star containing a hammer and plough (an early Soviet symbol) and the name of the new nation. While much of this source suggests unity between the classes, it is important to note that the Soviet revolutionary is gesturing and addressing the other two, who are listening intently. So while Moor is encouraging unity across the classes, he is also suggesting that the Soviets will lead the way in the new nation. As you complete your studies and examine different visual sources, you will encounter at least some visual symbols you may not be familiar with. For a glossary of common historical symbols and their meanings, visit this page. J. Llewellyn and S. Thompson, “Visual symbols in history” at Alpha History, https://alphahistory.com/visual-symbols-history/, 2018, accessed [date of last access].